In November 2018, Pat the Dog Theatre Creation was honoured to receive a Sector Innovation and Development Award from Canada Council for Regional Women Lead: A Grassroots Approach to Gender Parity for Women in Theatre. The award is National, significant and will provide supports for professional women theatre creators across Canada. The impulse for the project came from dissatisfaction with the long-term results of the Equity in Theatre Initiative (2015), specifically for Regional women practitioners. Pat the Dog Theatre Creation was one of two instigators of EIT alongside the Playwrights’ Guild of Canada. During this period, a new study “Achieving Equity in Canadian Theatre: A Report with Best Practice Recommendations” was researched and reported by Michelle MacArthur. Regional Women Lead, Women’s Work Festival, St. John’s, NL March 2019. Little relief from Invisibility factor (“if you can’t see it, does it exist and is it needed?”) coined by Rina Fraticelli in a study over 30 years ago. MacArthur asserted that various systemic and ideological barriers prevent women from achieving equity, the most significant being bias and discrimination. Her study shows that the rough 70/30 division of men and women in the artistic triumvirate –artistic director, director and playwright – has generally remained unchanged for the past 30 years. MacArthur provided a series of Recommendations for Best Practices. Despite a successful symposium held in Toronto in 2015, and a full issue of Canadian Theatre Review devoted to EIT (CTR 165/Winter 2016), MacArthur’s Best Practices Recommendations remain relatively unused and the momentum stalled. EIT’s impact did not affect Regional women practitioners, most of whom were not able to attend the 2015 Symposium due to barriers of access in travel, child and/or elder care. “Less work produced by women means less jobs not only for writers but also for actors as there is a corresponding relationship between women playwrights and roles for women actors,” stated O’Connell. We propose a grassroots approach. We believe that Regional urgency is the stimulation needed and that in our leadership, we will provide action impacting all women in theatre. Regional Women Lead will provide multi-layered opportunities for Women to tell their stories, including grassroots story collection and conversation cafés to Master Classes led by Governor-General Award-winning women playwrights. Mentorships will also be provided in playwriting, producing, directing and design. All activities will be led by nationally recognized theatre professionals who grew up in Regional centres themselves. That study, The status of women in the Canadian arts and cultural industries: Research review 2010-18, provides insight into the status of women in the arts in Canada. Research shows a pervasive gender-based income gap across all six sectors under review (visual arts, dance, theatre, literature, music and media arts/screen.) Overall, women’s average incomes are lower than those of their male peers – a defining feature of work in the Canadian arts and cultural industries. In fact, the Playwrights Guild of Canada’s Annual Theatre Production Survey (2017-18) stated that of 961 productions in the 2017/18 season, 60% were written by men, 30% by women, and 9% by mixed gender partnerships. Regional Women Lead will stimulate more jobs for women theatre workers and more representative voice for women in Canadian culture. 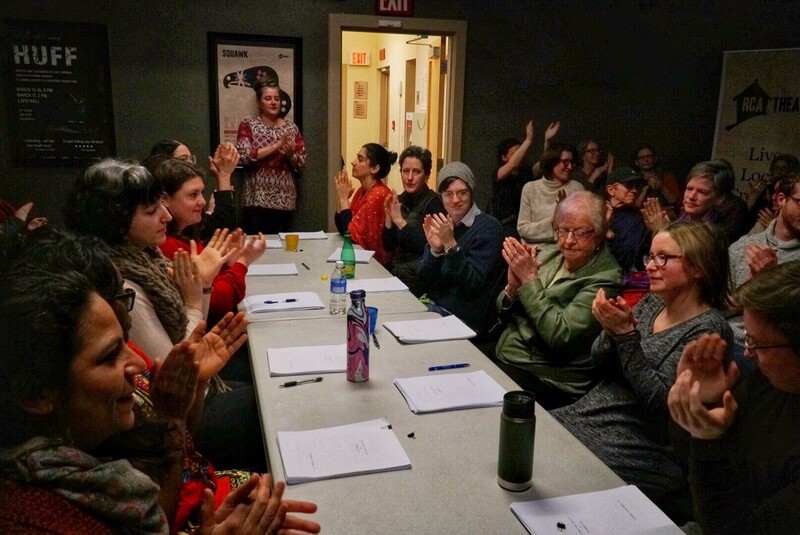 While professional women theatre workers will be the primary beneficiaries of this pilot, more representative work on all our stages and in the Canon will result in fuller more resonant Canadian culture. Representation and inclusion are innovation. It breeds possibility and spurs potential and progress.